IN THE MIX WITH HK™: TWO DYNAMIC DUOS OF EPIC PROPORTION! There have been loads of talented two man groups over the years. But it’s been more than 31 years since two musical duos took the top spots on the preeminent of charts - the Billboard Hot 100. 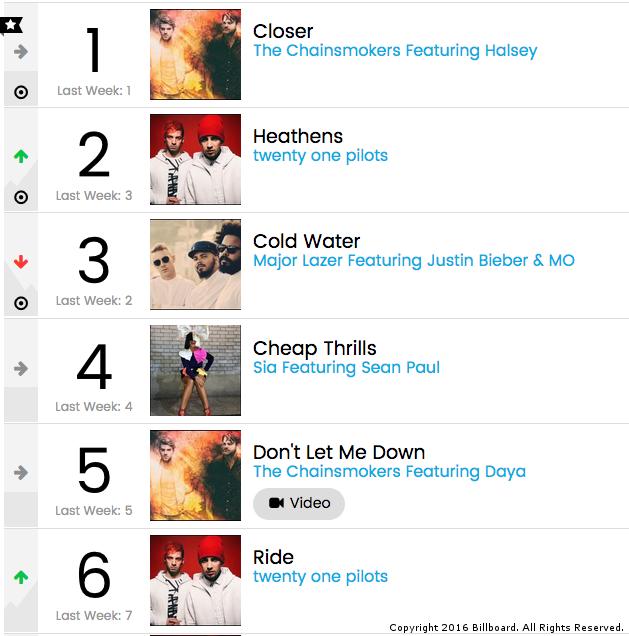 This week The Chainsmokers hold at #1 with Closer and Twenty One Pilots have jumped up to the #2 spot with Heathens . 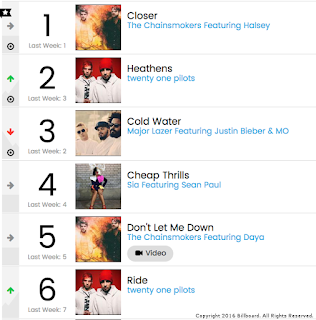 Making this feat even more certifiable is that The Chainsmokers are also sitting at #5 with Don’t Let Me Down and Twenty One Pilots have climbed to #6 with Ride. Too have such incredible, simultaneous success from the same two acts and then charting back to back not once but twice in the top six is a serious epic event! Kudos to these dynamic duos! I’ll tell you what else is epic!…the weekend party soundtrack I’m getting cued up just for you. I’m cranking out exclusive HK remixes on Adele, Charlie Puth, Kungs, Kiiara, Justin Timberlake and Daya. Plus new tracks from Lady Gaga, Meghan Trainor, Ellie Goulding, Frenship and so…much…more! When the needle drops there’s gonna be no Sitting Still And Lookin’ Pretty. You better stock up on Cold Water cause I got what the Girls Like, and a whole lotta Cheap Thrills. I’m Starving for a party and Pink is not the only one that is Just Like Fire, these decks are gonna be smokin’.